Did you know? Let’s Trace the Roots of Nagoya-meshi. The rich variety of Nagoya Meshi has a long history and deep culture behind it. Let’s look at the roots and growth of this food culture. The exceptionally rich flavor enhances the appeal of Japanese cuisine. 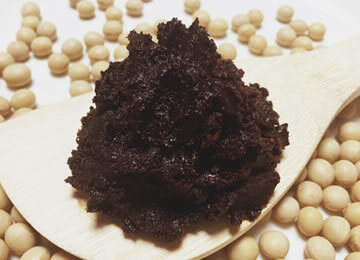 You can’t talk about Nagoya Meshi without talking about soybean based red miso. Soybean miso is made simply from soybeans and salt and is slowly matured, creating miso in its most basic form. Miso and soy sauce are fermented foods made from soybeans, and are flavored by an abundance of natural glutamic acid. While there is a salt-reducing effect, the flavor is protected, which is the healthy base of Japanese cuisine. Through slowly maturing the soybean miso, the taste becomes especially rich. 100 grams contains approximately 3,800mg, about twice that of rice miso (1,800mg) and barley miso (1,900mg). Soybean miso production and consumption is limited to the Tokai region. Soybean miso consumption is just 5% of the total nationwide rate. Most of this is consumed in the Tokai region. The deep, rich brown color and salty-sweet flavor is mostly unfamiliar outside of the Tokai area, and production is mostly limited to Aichi and Mie Prefectures, with Aichi Prefecture accounting for 76% of this miso. ‘Hatcho miso’ is a famous brand of soybean miso originating in Hatcho Village, now Hatcho-cho, near Okazaki Castle. Akadashi is the result of adding rice miso or other seasonings to soybean miso, or the miso soup made from these. Rice miso is from malted rice, barley miso is fermented from barley. Soybean miso is made simply from soybeans and salt. "The flavor comes from glutamic acid, and contains twice as much as rice or barley based miso." "Other types of miso are made within a year, however soybean miso takes one to three years to fully mature. " "This high quality miso is long lasting, and retains its flavor even when heated or boiled. " A Walk Through Aichi’s History with Nagoya Meshi. The three samurai heroes who took an interest in food during the Warring States Period (1467-1603). Aichi was the home of many samurai heroes, among them the Three Unifiers of Japan Oda Nobunaga, Toyotomi Hideyoshi, and Tokugawa Ieyasu. All three had a great interest in food. Nobunaga is said to have been fascinated by the foods imported by European traders including confectionaries such as Kompeito candies. Hideyoshi was fond of burdock and daikon radish from his hometown, and had it delivered regularly even after becoming ruler of Japan. Ieyasu was knowledgeable about food and grew his own herbs. He limited his diet to simple fare of barley rice and red miso, and lived to the age of 75, a ripe old age for the time. To control the nation, the Three Unifiers placed great importance on military provisions. Grilled miso was important during wartime and peace. The strength of Aichi’s samurai lay in soybean miso! The secret weapon of the samurai of Aichi was miso. It was a long lasting, highly nutritious, easy to transport and convenient food source, eaten in a variety of ways by both the high ranking military commanders and the lowly foot soldiers. 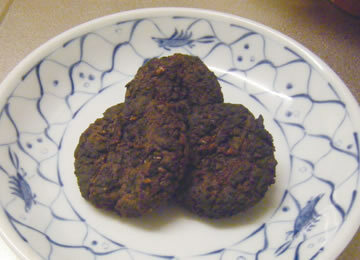 Flattened patties of miso were roasted for quick meal preparation. The delicious miso would be consumed in camp, and grilled rice balls would be carried as rations into battle. Some even had ginger and sesame seed included, or were grilled with sesame oil for extra energy. 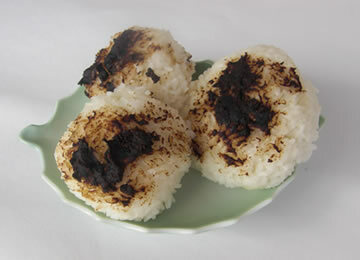 Rice balls grilled with miso look and smell delicious. They would probably sell well at convenience stores! The Tea Ceremony was popular among the samurai of both the Warring States period, (1467-1603) and the peaceful Edo period (1603-1868). This culture spread among the townsfolk too. The local ruling Owari Tokugawa clan were passionate about the tea ceremony and were active in its promotion around Nagoya, leading to the formation of the Matsuo-ryu tea school. 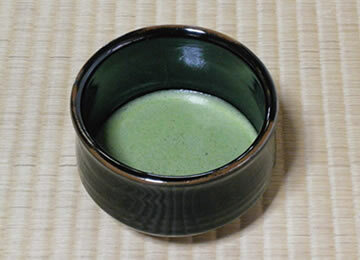 Serving green tea to customers, and drinking tea for relaxation became widespread, and generations later, would lead to the popularity of modern day coffee shops and the Morning Service daily breakfasts for which Nagoya has become famous. As Tea Culture Spread, Aichi’s Nishio City became one of Japan’s top tea production, and culture promoting regions. 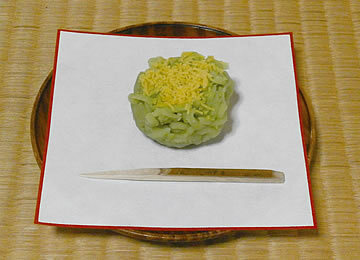 Nagoya Meshi originated with bean paste sweets. Japanese sweets are indispensible to the tea ceremony, and so it was only natural that a sweets culture also developed in tea loving Aichi. There is a higher than average concentration of highly skilled and creative confectioners across the region. While the national standard is \15,000 per annum, Nagoya residents spend over \20,000 on sweets per year. The sweet ogura bean paste remains a favorite, and ogura toast is another popular Nagoya Meshi dish. Uiro and Oni-manju, Aichi’s famed sweets and specialties are local secrets!